Some could even make the case that Amazon is a social media platform. Over the last several years, Amazon has built out a collection of tools and features that shoppers can use to promote themselves and their interests. Some are well known, like Amazon Associates, one of the first and most successful internet affiliate programs; others, like Vine Voice are less well known. The point is that these community tools add as much value to the Amazon shopping experience as does Amazon’s reputation for outstanding customer service. What does this mean to you, the content marketer? There are two ways to take advantage of this community. One is to join it by actively participating. The second is to mine it as a source for experts, ideas, and product information. Similar to what you do on other social networks, your public profile is an opportunity to add a photo and pertinent information about yourself and your business. You can choose to make it public or private, but I suggest public if you want to build credibility and increase the chance you will be contacted. Any review you write will be here, and when people click your name they can get more information about you, such as a link to your website or even your email address (should you choose to share it publicly). Click login, go to Your Account and look under Personalization. Under the heading Community you will see a link to Your Public Profile. Badges are short descriptions that display just below the user name that qualify and distinguish an Amazon user. Currently there are 17 types of badges in the Amazon system. Examples include “Real Name,” “Top 10 Reviewer,” “Manufacturer,” and “Help Forum Pro.” Many of these are assigned by Amazon based on user participation and contribution. Amazon is slowly building a community of people who take pride in how they are perceived, and so earning a badge is like having an advertisement for your expertise — it confers credibility on those that earn that badge. Have you noticed how some customer reviews on Amazon.com are incredibly detailed and thorough? Look under the reviewer’s name to see if they have a badge. Perhaps they do, or they could be striving to earn one of the six reviewer badges. And beyond these six, Amazon has yet another level called Vine Voice. 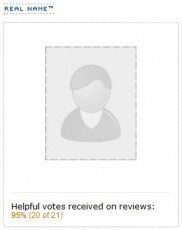 This is an invitation-only program that gives these reviewers advance access to unreleased products for the purpose of writing a review. Clearly these are good writers and subject matter experts. But you don’t need a badge to stand out — helpful and insightful comments also get noticed. In a recent post, author and music fan David Meerman Scott talked about being contacted by the producers of the Bob Marley biographical film to use one of his concert photos. Think of a review as a comment on a blog post. Make sure it is well written, fair, and helpful. The more votes it gets for being helpful, the more it helps your visibility. These are user-curated lists of products to share with the community. They appear throughout Amazon’s website as a product discovery feature. Both are lists of items you recommend as a collection — often they are books or movies, but they can be lists of any product Amazon sells. The key difference between these two site features is that So you’d like to… guides can have up to 5,000 words, while Listmania is simply a list of products. Collectively, these live as tabs under Contributions on Your Public Profile. It is another way to build your presence, share your expertise, or discover new, relevant subject matter experts. What about putting the Amazon community to work on your website? The addition of a store that sells products related to your business may give your visitors a reason to spend more time on your site. You might also make extra money for your efforts. Amazon aStore is a tool that enables you to build a professional-looking online store that can be embedded within your website or linked to from your website. It does not require any programming skills, and it is part of the Amazon Associates affiliate program. Embrace your Amazon presence and treat it like you would any other social media platform. Need a subject matter expert or writer? Look for books that match your subject and then scour the reviews for good writers, or even reach out to the author. Many will have a public presence that makes contacting them easier. Contribute. Add your comments to product reviews just like you would to a blog post. And as with any comments, be thoughtful about what you say because it will live forever on the Amazon site. Participate in discussion groups. Amazon’s discussion boards are active, and I recently launched an open group on Linkedin called Marketing on Amazon. 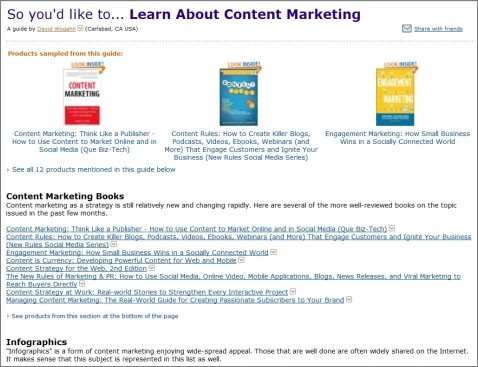 These are powerful tools and site features that do not require you to write a book. Use them yourself, but also use them to discover other experts. David is a 20-year advocate of content marketing and brand publishing and co-founder of eBook agency Sellbox. In 1995 he co-founded his first content marketing venture which helped university athletic departments establish their own media outlets on the Internet (now part of CBS Sports). David lives at the intersection of technology and publishing by helping companies, associations and publishers navigate and profit from the eBook revolution and content marketing. Follow him on Twitter @Wogahn.